Who invented the Seed Drill? The name of the person credited with inventing the Seed Drill is Jethro Tull (1674 - 1741). Jethro Tull is not only famous as the British inventor of the horse drawn Seed Drill but also as a farmer, agriculturalist and entrepreneur. When was the Seed Drill invented? Jethro Tull invented the Seed Drill in 1701, during the Industrial Revolution period of invention (1700 - 1860). 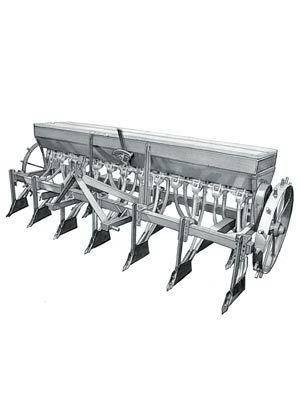 Definition of the Seed Drill: The Seed Drill is defined as a horse-drawn grain drill that automatically sowed seeds or grains in neat, even rows without any waste. Fact 1: Who invented the Seed Drill? The Seed Drill was invented by Jethro Tull in 1701 during the Industrial Revolution era of inventions (1700 - 1860). Fact 2: Who invented the Seed Drill? Prior to the invention of the Seed Drill in 1701, there were no tractors, and horses or oxen were used to pull the plow. Farmers had the time consuming and back breaking job of making holes in the ground and planting seeds by hand until Jethro Tull invented the horse drawn seed drill. Fact 3: Who invented the Seed Drill? The inventor of the Seed Drill, Jethro Tull, was born on 1674 in Basildon, Berkshire, England and died on 21 February 1741. Jethro Tull married Susanna Smith and the couple went on to have four children, two sons and two daughters. Fact 4: Who invented the Seed Drill? The early years of Jethro Tull were spent in Bradfield, Berkshire, England where he was raised by his wealthy, land owning family. His father was Jethro Tull, Sr, and his mother's name was Dorothy Buckridge. Fact 5: Who invented the Seed Drill? Jethro Tull received an excellent education and attended St John's College, Oxford, at the age of 17 to study law and taking up a career as a lawyer. Fact 6: Who invented the Seed Drill? Jethro Tull qualified as a lawyer in 1699 but soon after suffered with a serious pulmonary disorder which effected his breathing, lungs and chest. It was possibly tuberculosis, called consumption at the time, for which there was no known cure. Fact 7: Who invented the Seed Drill? Jethro Tull never practiced law due to his ill health and began farming on his father's land in Howberry near Wallingford and began to focus on improving the agricultural processes and began to formulate his own ideas about improvements to farming and agriculture. Fact 8: Who invented the Seed Drill? This was the Age of Enlightenment and Jethro Tull took a novel, but scientific, approach and based his ideas on observation rather than theory. Fact 9: Who invented the Seed Drill? Jethro Tull began to form ideas on how to streamline the agricultural process and reduce the manual hours spent of farm labor. Fact 10: Who invented the Seed Drill? Jethro Tull observed the labor intensive and time consuming sowing process. Holes were made in the ground and then seeds were distributed by hand into furrows. This process was referred to as "drilling". Fact 11: Who invented the Seed Drill? The whole process was inefficient and Jethro Tull became determined to invent a machine that would do this job mechanically. Fact 12: Who invented the Seed Drill? Jethro Tull invented the Seed Drill in 1701. He designed his Seed Drill with a rotating cylinder in which grooves were cut to allow seeds to pass from a hopper above (a tapered grain container) to a funnel below. The seeds were then directed into a channel dug by a plough at the front of the machine. The seeds were then immediately covered by a harrow attached to the rear. (A harrow was an implement consisting of a heavy frame set with teeth that was dragged over ploughed land to cover the seeds). Fact 13: Who invented the Seed Drill? The horse drawn 'Seed Drill' machine was hauled by a resulted in the seed being sown more sparingly and regularly in rows, saving more than one third of the seeds. Fact 15: Who invented the Seed Drill? In 1709 Jethro Tull inherited Prosperous Farm at Hungerford from his great uncle, where he raised his family and lived for the rest of his life. He used the horse drawn 'Seed Drill' machine at Prosperous Farm and looked for other ways to improve agricultural processes. Fact 16: Who invented the Seed Drill? In 1711 Jethro Tull travelled to the warmer climates of France and Italy which helped with his health problems and gave him the opportunity to study different faming techniques. Whilst he was travelling abroad he studied the agricultural processes used in Europe and returned to England with more ideas. Fact 17: Who invented the Seed Drill? In 1714 Jethro Tull invented the horse hoe plough which enabled just one man to cover six acres in a day. The horse hoe plough also helped to destroy weeds and led to easier reaping of crops. He later went on to invent a turnip drill. Fact 18: Who invented the Seed Drill? In 1731 Jethro Tull published his book "The Horse Hoing Husbandry", detailing his complete agricultural system and its machinery that increased productivity and reduced costs. Fact 19: Who invented the Seed Drill? Jethro Tull died on February 21, 1741 at his home at Prosperous Farm in Hungerford. He is buried in the churchyard of St Bartholomew's Church, Lower Basildon, Berkshire. Fact 20 - Impact: How did the Seed Drill impact the world? The impact of the invention of the mechanical Seed Drill and Jethro Tull's other inventions and complete farming system had a major impact on the Agricultural Revolution. Who Invented the Seed Drill - Jethro Tull - Inventor - Invention - Definition - Meaning - Famous - Important - History - Timeline - Innovation - Significant - Development - Agriculture - First - Definition - Kids - Facts - Information - Info - Who invented the Seed Drill - Dates - When - Why - Impact - Purpose - Use - New - Old - Amazing - Best - Definition - Meaning - Awesome - Cool - Seed Drill History - British - History - Timeline - Who Invented the Seed Drill?